Precious Cargo by Craig Davidson — defended by Greg Johnson, one of North America’s top professional storm-chasers and severe weather experts. I read and reviewed Precious Cargo in April, 2016. I was interested in reading it partly because of the subject matter, and partly because the author is well know for his dark literary fiction and horror novels. Imagine my surprise in finding out that his memoir was endearing, insightful, and amusing. Who would have guessed that Craig Davidson had always been considered the class clown? What I liked most about the book was the story of the kids on his bus – all of which have a “special need”. Davidson had no experience with special needs kids when taking the job as their bus driver. His story is well worth learning about. Will it do well in the debates? I have come to learn over the years that the best book does not always win, and that there is no predicting which book is going to do well and which is not. But it has potential. 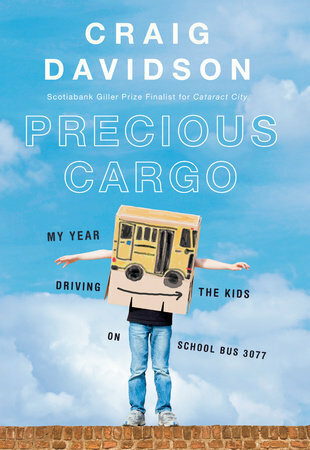 One thing Precious Cargo has going for it that many Canada Reads books do not is its humour. I think Davidson’s voice will appeal to a lot of readers. Forgiveness by Mark Sakamoto — defended by Jeanne Beker, the host of Fashion Television, among many other accomplishments. 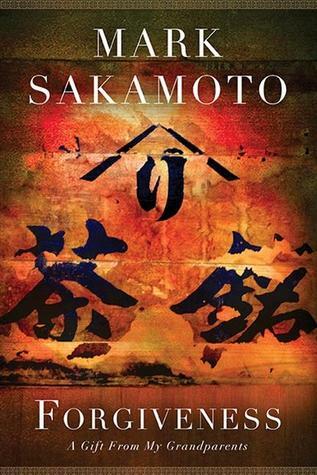 Forgiveness is the story of Mark Sakamoto’s grandparents – his paternal grandmother and maternal grandfather – and how they came to, not only forgive and accept, but to love and respect each other after the harrowing experiences they went through. At the same time as Mark’s grandfather was being tortured and starved in a POW camp in Japan, his Japanese-Canadian grandmother was stripped of her dignity and sent away from her home to labour on a sugar beet farm in rural Alberta. Not only is this a personal story of courage and forgiveness, but it’s also informative. It goes into the plight of the Canadian soldiers who were sent to Hong Kong with very little military support, as well as the politics behind the treatment of the Japanese in Canada during the war. Escott Reid, a long-time External Affairs official, later wrote, “I felt in that committee room in the presence of evil.” Pearl Harbour was a gift to biggots who wanted to remove the Japanese from B.C. and its economy. It mattered little that Canada’s national security – army, navy, and RCMP – were all on record stating there was no national security issue. Vitriol of that degree gets attention. It whips up, it grows, and it often wins. At times I found the writing somewhat flawed, but thought that the incredible nature of the story made up for what small faults were to be found. Even though I have read books on this subject before, I still find the prejudism of the time shocking. And his own personal experience with his mother is tragic. The subject matter reminded me of similar stories I have read and would recommend to anyone interested in reading more: Unbroken by Laura Hillenbrand, Obasan by Joy Kogawa (my thoughts), The Translation of Love by Lynne Kutsukake (my thoughts). In terms of the Canada Reads debates, I think readers will be drawn to the fact that this book is based on a true story, and struck by the characters’ abilities to rise above anger and resentment to arrive at love and forgiveness. American War by Omar El Akkad — defended by Tahmoh Penikett, an actor from the Yukon. There are so many things in this book you could focus on; politics, world building, gender differences, class differences, environmental issues, plausibility, and the burning questions about the story itself. This is what I think the book has going for it – its potential for conversation. It gives readers a lot to think about, relating to the world today and how these issues might take us into the future. One downfall it might have for some readers (and we have seen this before in the CR debates) is the desolation and violence. There is a war going on, after all. Some of it is hard to read, but in my opinion, necessary to understand the main character and how she went from a curious, innocent girl to an angry, destructive adult. I belong to what they call the Miraculous Generation: those born in the years between the start of the Second American Civil War in 2074 and its end in 2095. Some extend the definition further, including those born during the decade-long plague that followed the end of the war. This country has a long history of defining its generations by the conflicts that should have killed them, and my generation is no exception. We are the few who escaped the wrath of the homicide bombers and the warring Birds; the few who were spirited into well-stocked cellars or tornado shelters before the Reunification Plague spread across the continent. The few who were just plain lucky. 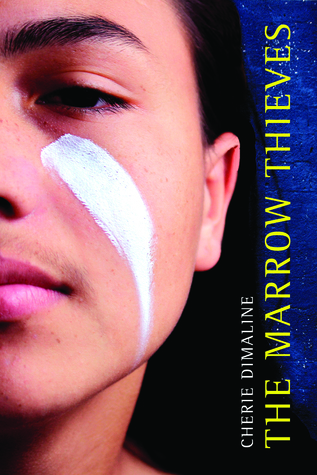 The Marrow Thieves by Cherie Dimaline — defended by Jully Black, “Canada’s queen of R&B”. The Marrow Thieves is the winner of the 2017 Governor General’s Award for young people. I really wanted to read it before the debates, but unfortunately it hasn’t come in for me yet. The good news is that this means other people in town are reading it! 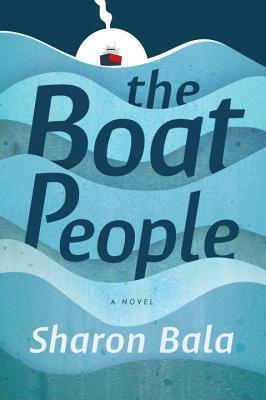 The Boat People by Sharon Bala — defended by Mozhdah Jamalzadah, the “Oprah of Afghanistan”. Update: My review of The Boat People. Goodreads synopsis: When a rusty cargo ship carrying Mahindan and five hundred fellow refugees from Sri Lanka’s bloody civil war reaches Vancouver’s shores, the young father thinks he and his six-year-old son can finally start a new life. Instead, the group is thrown into a detention processing center, with government officials and news headlines speculating that among the “boat people” are members of a separatist militant organization responsible for countless suicide attacks—and that these terrorists now pose a threat to Canada’s national security. As the refugees become subject to heavy interrogation, Mahindan begins to fear that a desperate act taken in Sri Lanka to fund their escape may now jeopardize his and his son’s chance for asylum. Laura from Reading In Bed has posted a Canada Reads breakdown, as well as her thoughts on three of the books (including the two I haven’t read), on her YouTube channel. And I hear that Kristilyn from Reading In Winter in posting a spoiler-y post of all the CR books on Monday. I will update this post at the end of each day to let you know which book has been voted off, and which one is the winner at the end of the week. Have you read any of the Canada Reads books? Will you be tuning in this year? Any favourites or predictions? Great synopsis. Will be an exciting week for CanLit lovers! Thanks for the shout-out! And great summary, it will be interesting to see how this plays out. I suspect I won’t have time to post blogs about it, but i’ll try to post on fb and twitter. This will be the extent of it for me, with the quick updates at the end (which are more for me than anything else!). This does look like a really strong list. Precious Cargo and Forgiveness especially appeal. I’ll be interested to see the winner! How kind of you to quote from my review of The Boat People. It’s the only one of the nominees that I’ve read, but I think the refugee theme is timely and would fit the “open your eyes” criteria. It’s not a particularly subtle book, but is “important,” yes (and I can see why that word would dissuade you!). I like the sound of Precious Cargo. Forgiveness also sounds promising, but your caution about the writing gives me pause. Unfortunately, The Boat People was voted off yesterday. It was surprising, even though I should know by now not to be surprised by anything that happens at Canada Reads. I think I will still read it at some point! Yeah, I heard that — too bad! I didn’t realize it was Survivor-style judging, so maybe Bala was voted out strategically as too strong a contender? I know what you mean. There might be nothing wrong with a book, just that others tell a similar story better. Unfortunately, strategic voting does come into it – one of the things that irk me. But kind of hard to avoid! I remember you posting about this event before. It’s such an interesting way of presenting books. It’s a big event over here! And, even though there are certain things about it I might like to change (if I was in charge – ha! ), I love that we have it! I did read American War and thought the ending was a pretty brutal take. It made me turn away from really liking the book. It’s just all pretty dark. If I had to guess I’d say it’ll either be a) The Marrow Thieves or b) The Boat People. I would have guessed the same two, as well… but I am always wrong! haha! 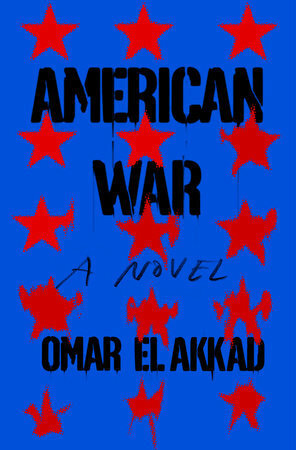 American War is really dark, and I don’t mind that as a reader, but it’s definitely a point against it in the debates. Although, Tahmoh is using the loss of empathy as his defense, which is a good angle and one I hadn’t thought of! Thanks Naomi! I won’t be able to watch live 😦 but I’m ready to flip a table over if The Marrow Thieves goes out first. I was relieved for your sake that it wasn’t! 🙂 But what if it’s second?! I agree – it would be pretty cool to see it win! Ahhh this is such a great summary. Now I will feel somewhat more prepared to tune in to the debate, despite having only read one book! Thanks for including me! YES! It absolutely is! It’s on TV, you can stream it online and I think they turn the debates into podcasts as well! Whaaaaaat!? That’s crazy! We have NOTHING like that in the States. Wasn’t PBS trying to put something like it together for this summer? Hmmmm…. Not that I’ve heard of. Which award would it be? The Great American Read!! Starts May 22nd. I’m glad to hear it! I don’t feel as out of the loop as I thought I would having only read 3. I made sure to read lots of reviews of the other 2, so I’d have a good handle on them. Intriguing list of books. I’ve not read any of them, but just from your descriptions the Davidson and the Dimaline appeal most to me. I’ll be interested to see which one wins! It’ll be interesting to see how far Precious Cargo goes – we don’t usually have such a humorous book on the table. But it would be cool to see an Indigenous book geared toward young people (Marrow Thieves) win out! Very cool. American War is on my 2018 TBR list. I hadn’t heard of any of the others, but I’m intrigued by The Boat People and The Marrow Thieves. My knowledge of Canadian literature is embarrassingly bad. I need to make better use of recs from this blog! Great post – and thanks for the link to my own! I am so glad to see someone else who really enjoyed Precious Cargo. It’s the one book out of the five that I most enjoyed reading and thought it had so much heart AND it was the only book to make me cry. American War was just so-so for me. It was an okay book, but definitely not one for Canada – I mean, where IS Canada in that book?!? I liked Forgiveness but I think that the theme of forgiveness is lost as the book goes on and it has trouble sticking to a central theme. I wish there had been more of his grandparents in that book and less memoir. I’m definitely interested to see how this all turns out! This is the first year I’ve read all the books and have actually watched the debates – it’s very exciting! I didn’t know this was your first big CR year – very exciting! Except you probably didn’t enjoy vote #2 very much. I was really surprised by it after the rant she had just gone on about American War. Oh well… that’s how it goes! I don’t think you’re alone… I know a few other readers who don’t follow it for various reasons. I think it’s fun, even though there are some things that I’d change if it were up to me. I also like that it not only gets people *reading* books, but also *talking about* books. It’s also very good for the authors – many of them not very well known before making it onto the list. There’s never been a year that I’ve heard of all the books on the longlist! Great roundup! I’ve only read American War, which I really enjoyed, but I wonder if it can hold up to the theme in the same way it appears many of the other books do. I wonder the same thing – it’s very American, for one thing! I thought it was gone for sure yesterday, but it’s holding on! Hi Naomi! I own The Boat People and Precious Cargo, and wanted to read Forgiveness – but haven’t read any of them, and didn’t watch any of the coverage of Canada Reads this year at all. Like you kind of mentioned, I think it’s time to burn it all down and start it up fresh and new- it’s really drifting too far into overly competitive, personal attacks and shameless fighting, insulting and yelling at each other and not even talking about the damn books. I thought last year was pretty bad for this and it truly sounds like this year was another terrible bout of gross behaviour. It’s a competition, yes, and I get that, so of course it will lead to many upset people about the books that are eliminated and the books that are the chosen winners – but I just have to think there HAS TO BE a better way of handling this. Of discussing the books, of championing all the books that are profiled, and truly discussing the content of the books to the theme (which is so recycled and rehashed every year that it too needs to be burned down and started fresh from the ashes). 🙂 Just my opinion but I’m quite glad to not have bothered with CR 2018 this year – Penny. I agree that the theme always seems too much the same – and it always leads to heavy books and emotional debates (not that I mind a little bit of emotion). I was thinking it might be better to have “categories” – it would still help to narrow down the selection, but maybe wouldn’t be quite so personal? Yes, it was pretty clear who was a reader and who wasn’t. And it’s fine to be a non-reader, just not so fine on a panel of people discussing books. I think some of the “discussion” that happened could have been avoided had they all been better acquainted with books in general. That’s a real shame that it sounds as though many of the panellists didn’t even read the books beyond the one book they were championing. As far as I could tell, the panelists had read all 5 books – I just meant that most of them didn’t seem to be big readers in general. In terms of how it all went, I would say it was better than last year’s. But everyone’s looking to get different things out of the show. Some people probably like the very things that we don’t! Overall, I enjoyed this year’s debates SO much more than last year (which seemed sad and angry much of the time – maybe just a challenging combination of personalities and books, against this ongoing backdrop of competition). I was surprised, in some ways, that Forgiveness won, because the theme of “a book to open your eyes” seems like it fit all the other books in multiple ways, whereas Forgiveness seemed the most familiar and the most recognizable story. It seems to me to be one of the books least immediately connected to the issues we see in today’s headlines (although obviously all stories about historical war and love and loss are connected to the international and civil conflicts that rage on today) along with Precious Cargo (although with ever-increasing diagnoses of neuro-stuff in kids, I think this could have been made to seem more pressingly relevant too, if the defender had gone a slightly different way – but maybe he thought that was too depressing to think about :> given his approach). CR is still a conversation about reading, and I like seeing all the students in the audience (although most of them look like they’d rather be ANYplace else) and imagining those classes as a welcome departure from more traditional English class assignments, but I wish they would return to more of a focus on the books and the writing. And as others have said, to selecting panelists who actually do read to be there to discuss reading. This sounds SO cool. It’s almost enough to make me want to reactivate my Facebook page just so I can watch the videos. Those all look like great selectionst too! Thanks so much for letting me know about this – it’s great to see a couple of indie presses represented here too (not just the mainstream publishers that Canada Reads has been favouring).